Watch Laird float above the water on this sunset wave, captured by a drone. In this drone video Hamilton shows us why he is such a big wave legend in Hawaii. Laird uses his special floating surfboard to hoover over some huge waves in #Hawaii. Originally born in San Francisco, Laird’s family relocated to Oahu while he was just an infant. Even at an early age, Laird was dominating giant waves and innovating new ways of surfing. The crazy thing about this generation, is the technology! We now have drone video Hamilton couldn’t even have imagined himself as a young gromet splashing surfers up and down the coasts of Hawaii. This clip for instance, shows fast aerial shots of Laird on massive waves that look like they’re never ending. But even drone technology can’t keep up with Hamilton’s crazy skills. 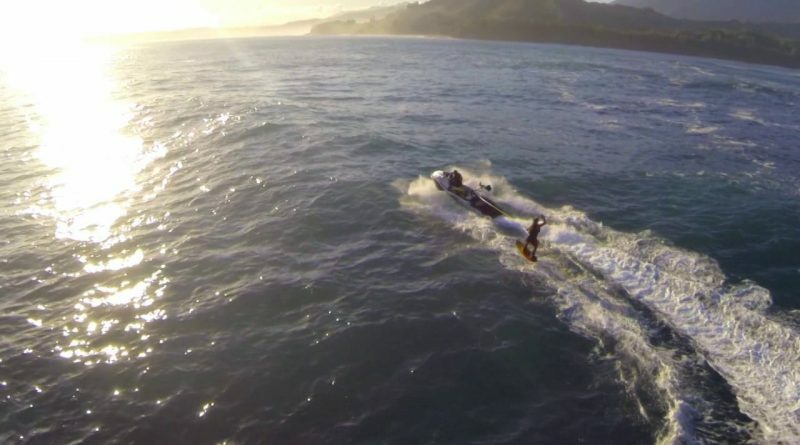 Watch as he catches a huge wave and rides it all the way to the jetski to get towed to another wave – WITHOUT FALLING OFF HIS BOARD! What?!? This #drone video footage was captured by a #DJI Phantom. Thanks for the dope footage Adam Guy!